In this mini-expansion, you will be able to steal points from your opponents! When you place one of the Robber tiles, you can place your Robber meeple on the scoreboard next to the meeple of one of your opponents. The next time this player scores points, you add that same number of points to your score. Your Robber then returns to your supply, waiting for the next chance to strike. 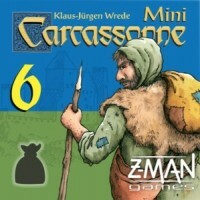 The base game Carcassonne is required to be able to play with this mini-expansion. Add a Review for "Carcassonne: Mini-expansion #6 – The Robbers (Second Edition)"